Traditional paper-based drawings may be the status quo for many in the Canadian construction industry but some leading-edge innovators have made the transition into the digital world. Building Information Management (BIM) has already taken root in some sectors and is proving to be an invaluable tool – even in the piling industry. According to Rayner, there is still a lot of confusion around the concept of BIM. This has led to some hesitation and a slow adoption rate. The use of BIM-enabled software allows users to access and manipulate data throughout the various stages of construction – from the design through to facilities management. There are many significant advantages inherent in the use of BIM, according to Summit BIM Consulting. These include: collaboration, cost certainty, facility asset management, improved quality, informed decision making, increased productivity, reduced FM cost, reuse of data, reduced changes, reduced risk, and sustainable design analysis/visualization. At the end of the day, BIM can reduce a project’s overall costs and improve efficiencies along the way. A report from the Construction Task Force in the United Kingdom, Rethinking Construction, cites recent studies that suggest: up to 30 per cent of construction is rework; labour is used at only 40 to 60 per cent of potential efficiency; accidents can account for three to six per cent of total project costs; and at least 10 per cent of materials are wasted. Rayner describes BIM as a number of different tools. Each segment of the construction industry has its own tool but there is a common “language” that allows everyone to talk to each other. The information is entered once and then used repeatedly throughout the different phases of the project. It may involve a bit more work at the front end but that extra work will reap digital rewards throughout the entire project – even once that project has been handed to the owner in the facilities and operations management phase. Summit BIM Consulting typically works with building owners, many of whom have used BIM to great advantage. Other important elements that BIM brings to light – before actual construction – are soft and hard “clashes”. The former refers to having enough space within a certain area of the building to do the required work and the latter is used to identify actual obstructions, such a pipe hitting a duct. All of this becomes readily apparent when working in 3D. “There’s no doubt that BIM has the potential to improve industry efficiencies,” says Rayner, who adds that the design side of the industry has the skill set to start generating this data and many of the large construction contractors have evolving BIM departments – all of which is very good news. 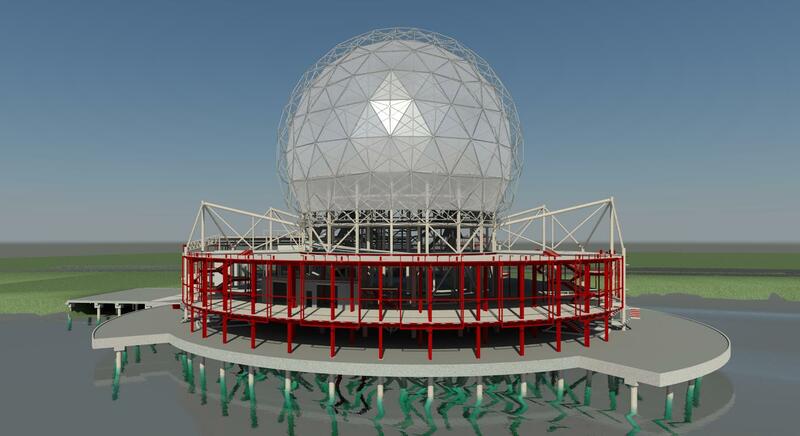 When consulting structural engineering firm, Bush, Bohlman & Partners, was awarded the $35-million renovation project to Science World in 2011, they didn’t hesitate to make use of Revit Structure within a BIM process to create a 3D digital version of the existing building structure. That foresight has paid huge dividends along the way. Science World at TELUS World of Science is located in an iconic geodesic dome, which was originally built for Expo ’86 as a temporary structure. The building is close to 30 years old – and still going strong. This is due, in part, to the massive structural engineering work completed in 2011. “Part of our work in 2011 was to do a seismic assessment and retrofit of the original Expo building podium structure utilizing 3D dynamic analysis,” states Michael Sullivan, CTech, a Structural Technologist/BIM Specialist with Bush, Bohlman & Partners (consulting structural engineers), who adds that the podium and base structure support a 47-metre high geodesic dome and was built partially over water. “The existing building structure used a complex and congested pile-supported foundation system – with battered piles at major column-support locations. 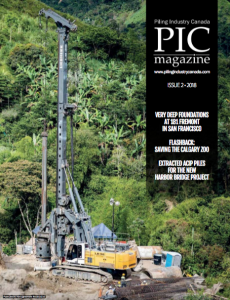 During this expansion project, over 400 – or 98 per cent – of the existing piles were modelled digitally,” he explains. Extensive new piling work was required on the Science World podium base structure’s existing foundation system. Large steel moment-resisting frames were centred along the radial gridlines on the west side. The frames were anchored by custom-cruciform shape, wide-flange columns. The steel columns were then supported by the new pilecaps keyed into the existing concourse level such that no additional gravity or seismic loads were transferred back to the existing structure. Bush, Bohlman & Partners used Revit software to determine where the existing piles were located so that workers could cut through the podium’s deck structure to drive the new piles. The west side of the Podium structure required over 40 new concrete-filled steel piles, of which 30 were battered piles. The former were 508 centimetres in diameter and 15 metres long. The latter were 610 centimetres in diameter and 15 metres long, each with a 55 milimetre diameter Dywidag rock anchor. All of these piles had to be driven from a rig set up on a barge on the False Creek side of the building. The renovation and expansion work on the east side of the podium wasn’t as extensive and didn’t require seismic upgrading to the existing previous expansion completed in 1988. A total of 20 new piles were driven to support the new entry sequence and augment the structure’s existing foundation system. Although the benefits of using BIM tools were well established – and capitalized upon – during the 2011 renovation project, it looks like it may be a case of where BIM just keeps on giving. Last year, TELUS World of Science again approached Bush, Bohlman & Partners. In 2014, Bush, Bohlman & Partners completed the condition assessment study of the entire existing building and expansion base structure, which involved going out in a small boat at low tide and doing an extensive visual study of the underneath of the existing base structure. This study revealed the damaging effects of salt water on the existing steel piles and these were categorized within the 3d digital model to create a comprehensive condition assessment report of the base structure. This information will be used to facilitate any future remediation work. Fortunately, Bush, Bohlman & Partners already had completed a lot of the preliminary work required in the condition assessment study – thanks to their use of BIM on the 2011 renovation project.